And so I plunged in, late one morning. Headfirst? No, I will dip my toes in tentatively as I search for a way to describe to you what it is I make, I do, I feel. Okay, let us start with the physical: I make works on paper. I collage mainly, and I frequently collaborate with Louise Jennison too, a fellow aficionado of paper, together we play with all the wonder paper affords. Folded, layered, cut into, printed upon, glued together, bound in book form, of varying scale, few mediums are to me as adaptable as paper. Yes, we are paper fiends. Artists' books, limited edition prints, small publications and zines to collage works, they all of them stem from a love of the medium. For my own collage work, I use small sharp scissors to cut, and sometimes I use a mouse in my palm to click my way through an image digitally, collaging digital layers much as I would paper. Both yield different results, and though I prefer the feel and process of cutting with scissors, I enjoy the diversity possible when layering with digital collage. Often the two are married, and in a single print you can find elements of both intertwined. 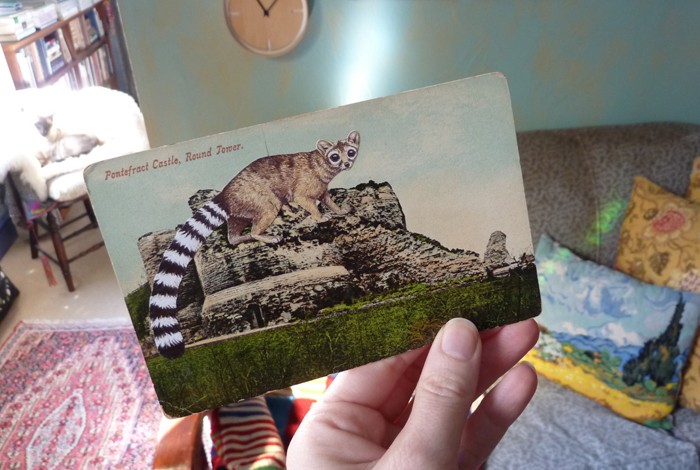 Upon the pages of my collaged artists' books and throughout my ongoing series of postcard collages, you will find the geography dotted with fragmented keepsakes, and many animals and birds. My tailed or feathered protagonists appear often out of place, oft too large for their present surrounds. They scale rooftops, climb cathedral spires, or perch high in treetops of a landscape I have not personally walked through. Sometimes they saunter nonchalantly past a city square. Sometimes they tiptoe or creep. All the time they afford me chance not just to play with scale and humorous, I hope, foreign juxtapositions, but to convey feelings of awkwardness and oddness. They are out of place, not just in urban environment or strange land, but also in feeling. Being of animal form, they are easier for one to relate to. Undistracted by the dissimilarities simply because there are so many; I am not covered in fur, with claws for fingertips and a tail to serve as rudder on mountain climb. I am so different that I look only at what the animal is doing in its new environment. It is on the sidelines, watching. It is looking for a safe place to curl. It is passing undetected. It is slinking through the city unseen. It, like me, feels the odd one out. When working I am seduced by nostalgia and fiction. This has long been the case. Do you make a living out of your art and related practices — or do you combine it with another job? Any money made from the sale of artwork seems earmarked for another piece or artists' book. The sale of works from a recent show with Louise, A key to help make your own world visible at Craft Victoria, will go towards paying for the printing and making of our next body of work. The sale of my collaged pieces will go towards the procuring of more raw imagery to twist the narrative of, and to new story give. Part may go towards the gas bill in reality, but in my mind, it goes towards the making of more artwork, always. This income source, naturally, is combined with several other jobs held, all of which are largely freelance or done from home. I teach oil painting to students who study through distance education (through RMIT university), and have been doing so for ten or so years now. I also build websites for others and take on commercial design work, designing invitations and catalogues for galleries, and, as with the majority of my artwork, Louise and I work collaboratively in this field. I am more at home with html code and editing, and Louise with InDesign, Photoshop and print management. Sometimes illustrative work is also picked up, such as pieces created especially for The World of Interiors. From this somehow a livelihood is eked out and a balance between own work and work for others found. For over ten years now, I would say, though such things are hard to determine. I graduated from RMIT in 1997, and have continued ever since. Have you had a big break? If not; any turning point? No big break, as such. It feels more like a series of many small steps in a direction I like. Many things have occurred that from the outside might appear to resemble luck and good fortune, but it is quite a climb at steady pace. Stamina is required for the setbacks and a level head to keep the ego in check when good things arrive. Along the way we have worked, through our collaborative endeavors, with many kind and talented souls whom, you could say, have given us "a big break". Friends, family and peers to the galleries we have shown with have all in own way made it possible to stick at what can at times be a hard path. Through a successful grant (Freedman Foundation Travelling Scholarship for Emerging Artists), travel to Switzerland to study bookbinding in early 2002 was a turning point, an awakening to possibilities. What is your primary client base? Friends, initially, beautiful and supportive friends (of which naturally included blogging friends) and family. This has since grown to include a handsome swell of private collectors. Lately, through exhibitions held, many people purchase my work and the collaborative pieces with Louise whom neither of us knows. All of which is thrilling. Prints and artists’ books have been acquired by various collections for state libraries and art galleries. Describe your work environment. Do you work alone or with others? In a studio or at home? Does this arrangement work for you, and if not, what would your ideal work environment look like? I work from home and it suits my reclusive nature. It suits my temperament. I do not wear a watch at home, or any jewellery. I work pretty much undisturbed, governed by own rules: coffee when needed, something to eat when needed. It is sometimes wholly self-indulgent. It is sometimes flexible; I can work for a long stretch of time. In such periods, time of day or night does not come into play. Conversely, it sometimes follows a pattern, and I find myself doing the same things at the same time each day. The reality is it varies day-to-day and week-to-week and that is why I love it so when it is going well and grumble when it is not. Were it a sea it would be choppy for a period then calm, choppy then calm. It is never, as expression goes, smooth sailing. Do you have a typical workday? How much time do you spend creating and how much on business related activities? No typical day, as such and some days, I do not make nor do anything remotely creative. Some days I do not read. Some days I do work, such as design jobs for other people. Some days I do not feel like doing anything other than napping at length and enjoying a rich lunch. A good workday for me would be to rise in own time, with an idea in my mind. I work best in the morning, lately, before I have spoken or bothered my mind with things that have nothing to do with making. It is spell-like, trance-like, this state. As soon as I engage in email or dishes to wash, my mind lurches into the humdrumness of day-to-day and I think silly thoughts. The neighbours converse loudly, the floor needs to be mopped, things crash in and take over and I let them. Which marketing strategies have/have not been successful in advancing your career? I do not think I am very good at that side of things. In addition, I am no good at pricing my own work. I can promote my doings on my blog though, and having built our website, if that can be seen as strategy. I meet deadlines set by galleries and the like in advance, if I can, and I try to be thorough. Perhaps that, too, could be a strategy. Can you share any tips on business organization or financial planning that have worked well for you? In 2000, Louise and I jointly received an Australia Council for the Arts (New Work, Emerging Artist) grant. Our application successful, with it we made our first six limited edition artists' books. Without said grant, the artists' books in question would have looked considerably different. It enabled us to have the books bound by a bookbinder until we could polish our skill. It enabled us to imagine things possible. In terms of financial planning, we try to be as economic with materials as possible. Book sizes are governed by proportions of the paper, prints by the cost of the plate. If there is any space remaining, one of us will fill it with a small work. Resourceful is something we all need to be in our practice. Sometimes things are printed in single-colour as opposed to full in order to be done, to come to fruition. Other ways are sought when there is a hole in the pocket. Zines made on the copier machine are for this reason double the fun for they cost so little. No financial planning required. Bliss. Do you have any advice on how to rebound emotionally from rejection or difficult client situations? Lick the wounds and wallow before swiftly moving on with your best "I didn't need them anyway" swagger. Take comfort in the fact that you are not alone, I guess. Based on your experience, what suggestions or lessons learned would you give to someone starting out as an artist? Stick at it. Keep going. Make work because you like it, enjoy it. Make work that is yours. What would you like to accomplish in 2010? I have no set idea in mind; I’ll have to see what comes. That said I hope I will make the most of a group show Louise and I have been invited to take part in later in the year (August through September). I hope to not let A skulk of foxes and a husk of hares languish. In addition, I hope it is a good year full of promise. I hope it is full of ideas. I would dearly love to see my postcard collages printed in glorious colour and bound in a book. I could not fund such a thing so perhaps I will take steps this year to bring it a little closer into being. What are your long-term career goals as an artist? To be making artwork for my own enjoyment, own sake, when I am older. To be wiser, too, that wouldn't hurt. Finally: Can you share something inspiring? Having spent my January days largely devoted to reading, I can recommend Herta Müller's The Land of Green Plums. Its circular pattern, her use of repetition, looping back and forth, with symbols reoccurring, this book has stayed long in my mind’s eye. I can also recommend Hermann Hesse's Der Steppenwolf and Orhan Pamuk's The Museum of Innocence too. Of tremendous influence and in my opinion, in similar vein, let's add Dostoevsky for a revisit or new acquaintance formed, Svetlana Boym, Doris Lessing, Iris Murdoch, Milan Kundera, Andreï Makine, Stevie Smith, Barbara Kingsolver, Italo Calvino and end with Chekhov. Books purchased, books borrowed, books read; there is something in their embrace that is comforting. This is true, for me, of film also. Film festivals, if money permits, I live for. As a rule to be guided by, inspiration is best grabbed with both hands when found for it can be elusive.